Gordon Parks had been a member of LIFE Magazine’s staff for no more than a month when a tantalizing assignment dropped into his lap. 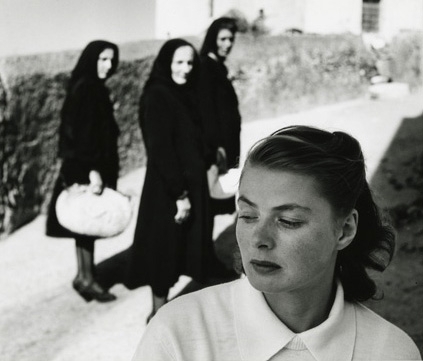 His editors sent him to the small volcanic island of Stromboli, not far off the coast of Sicily, where the Italian neo-realist director Roberto Rossellini was making a film with the actress Ingrid Bergman. Parks’ mission had little to do with the film and everything to do with the love affair between the director and his star, who had left her husband and child for him. It was an international scandal. Bergman’s fans, who perhaps took her recent roles as a nun in The Bells of St. Mary’s (1945) and the virgin saint in Joan of Arc too seriously, had turned on her. Knowing that a good scandal can drive sales, magazines and newspapers throughout Europe and the United States were locked in a fierce competition to get the first photographs of the couple in an embrace. As Parks told the story in his various memoirs, he and Maria Sermolino, a writer from LIFE’s Rome bureau, arrived on the island just in time to watch Rossellini, in a fit of exasperation, order the press away. Rossellini, Parks said, ruled the island like a dictator. But he allowed Parks and Sermolino to stay, and that was due entirely to Bergman’s intervention. Bergman had noticed, however, and she was grateful. A few days later, she invited him to follow along as she and Rossellini walked along the island’s shore. On their own terms, they gave Parks the photographs that his editors wanted. Despite their range and emotional power, LIFE chose not to use any of Parks’ photographs in the story that it ran on Rossellini and Bergman’s affair. But Parks published and exhibited the two photographs of Bergman and the three women in black throughout his lifetime. In one, Parks emphasizes Bergman’s vulnerability; in the other, she seems more knowing. Both seem to reveal a rare intimacy between the photographer and the subject, and in the decades since he made them, they have become two of his most iconic images.